Took the weekend off. (Yes, really.) The idea was to join DH on a cycle ride, so Saturday morning meant buying important things such as a gel seat (it’s so long since I’ve ridden said bike that the mice had, ahem, nibbled the seat, so that's my excuse), plus a cycle helmet and a bike computer (the idea being so I can track my progress from feeble first wobbles through to a longer ride - well, hey, that's Kate Nerdy for you). However, I forgot one thing. Bank Holiday means rain. And rain did indeed stop play. 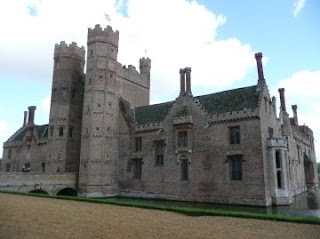 Too cold and windy to cycle yesterday, so we dodged the showers and went to Oxburgh Hall. 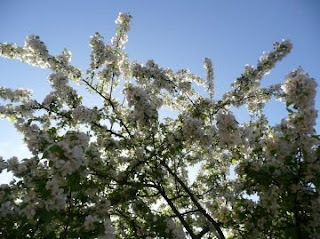 Now everyone’s back at school and work, we have nice weather again, and the tree in the front garden is just full of blossom. Today: Tuesdays are days when I don’t do much work, but I’m drumming it into my head that this is scheduled time off and not getting stressed about it. So this morning I have my guitar lesson, aka my ‘me time’ for the week; it also sets me up for Tuesday afternoons, which are becoming more and more difficult as Dad’s dementia progresses. I know I’ve done my best by him, but how I wish I had a magic wand and could fix it. Hello Kate! I’ve just found your blog – delightful! Reading M&B news I’ve discovered that this month your book entitled “The Italian GP’s bride” is going out here in Italy (I’m Neapolitan). The plot is very interesting and can’t wait to read it! Am I wrong or is it set in Napoli too? Buona sera, Michela! Lovely to hear from you. The Italian GP's Bride is indeed set in Naples (my other one with a Neapolitan setting is "Hotly Bedded, Conveniently Wedded"). Do hope you enjoy it. I'm actually going to be visiting your part of the world in July and can't wait! Thanks for the tip about the other book Kate! Do hope you’ll enjoy your stay in Napoli – I know I’m biased since it’s my hometown but I’m sure you’ll fall in love with it! Michela - am sure we'll have a wonderful time, and I'm definitely looking forward to tasting PROPER pizza!